There’s a lot of great eCommerce advice out there—on YouTube, on podcasts, and on blogs like this one. But sometimes the only way to solve problems is to engage with other eCommerce professionals. You can read every blog posts on a topic, watch every video and still have unanswered questions. Luckily, there are a lot of places you can engage with other store owners and managers online. Facebook groups offer some of the best opportunities to connect with people who have been there, done that, or who are going through the same trials as you. These kinds of communities offer tremendous sources of knowledge, insight, experience, and inspiration. And sometimes being a founder can be lonely. If you just need a little motivation to keep pushing forward, the supportive communities you’ll find in Facebook groups can provide fantastic encouragement. But where you do you start? There are a lot of Facebook groups, especially in the eCommerce niche. We’ve gone through them and curated this list of the Facebook eCommerce groups we think you’ll get the most from by joining. This Facebook group was created by the people behind A Better Lemonade Stand, which they describe as “an online eCommerce incubator” that helps stores make better decisions as they grow. The founder of A Better Lemonade Stand is Richard Lazazzera (who also appears on our eCommerce Twitter influencers list), a former member of Shopify’s growth team. At Shopify, he “reverse engineered” the process of building and growing eCommerce stores to inspire and educate eCommerce entrepreneurs and managers. The group discusses anything related to eCommerce, from beginner to expert topics. We’ve seen a lot of posts about ad optimization and discovering unique marketing strategies. This is one of the largest and most active eCommerce groups on Facebook. Group members discuss the full gamut of eCommerce: From setting up stores and starting your first marketing campaigns to optimizing funnels and building inventory systems. The group was founded by Justin Cener, a well-known eCommerce guru. He founded and eventually sold a seven-figure eCommerce company, so he understands the struggles of eCommerce professionals no matter what stage of the journey you’re in. The commentary by the group’s founder is useful, but the majority of the discussion hovers around topics for new store owners, like running paid advertising campaigns, adjusting store themes, or using tools. If you run a mid-size or larger store ($10K+/month), this is a good group to watch for interesting nuggets, but other groups on this list might be more worth your time. This group was founded by bestselling author and speaker John Lawson, a well-respected authority on social commerce and selling online. He’s helped major Fortune 500 companies refine their eCommerce presences, including AT&T, IBM, FedEx, American Express, Accenture, and HubSpot. Much of this group’s discussion has to do with selling on marketplaces like Amazon, eBay, and Etsy. They discuss search engine optimization, social selling, and leveraging platforms. That said, there’s still plenty of talk about direct-to-consumer eCommerce through self-hosted stores using platforms like WooCommerce and Shopify. WooCommerce is one of the most flexible eCommerce platforms, but it requires more technical know-how than hosted competitors. When you need help setting up plugins, editing a template file, or finding an obscure setting, it’s nice to be able to turn to someone who has been through it all before. That’s why the WooCommerce team started this Facebook group to help their users get the most value out of the platform. The Advanced WooCommerce group is a fantastic resource for WordPress-based stores. It’s full of WooCommerce users and developers helping one another build, tweak, and optimize their stores. This is not a group for newcomers, and it’s not the place to ask easy-to-Google questions. As they say in their group description, “If you are a new user or not experienced with web/WordPress development, this is not the group for you. ” Rules against self-promotion are also actively enforced. Speaking of hosted eCommerce platforms, Shopify is easily the largest. While this community isn’t affiliated with Shopify, it is the largest unofficial group for Shopify users on Facebook. Shopify Entrepreneurs is a private group of Shopify store owners, designers, marketers, managers, and other eCommerce service providers. It was founded and is moderated by a team of certified Shopify partners and app developers. This community is an excellent place to get specific feedback about your store. They encourage members to post mini-case studies about what they sell, what they’ve tried, and the challenges they’re facing. Interestingly, the moderators of this group play a strong role in its content. They manually approve every post before it’s published for the group. Users submit more than 100 posts per day, but only around 20 of them get approved. The Amazing Seller Facebook group is a companion community for The Amazing Seller Podcast. The group’s original purpose was to create a community to discuss podcast episodes and communicate with the hosts, but it’s grown to become much bigger than that. Most of the community’s discussion focuses on selling via Fulfillment by Amazon. Listing on Amazon is quite intricate, so this community will answer your questions. Some of the lessons are transferrable to those running an eCommerce store outside of the Amazon ecosystem (and they do talk about more general eCommerce topics, too), but mostly, this group will appeal to Amazon sellers above all others. This is a massive Facebook group (as you can see by the member count and post volume), so don’t try to keep up unless you’re prepared to read 15-20+ posts a day. Look out for content published by the group’s creators. It’s usually the most valuable. If your eCommerce store is young (sub $5,000/month in sales), check out Ecom Empires. Some members claim to generate upwards of $100,000/month, but the majority of participants have been in business less than five years and are just beginning to grow their teams. They discuss a wide range of topics for eCommerce stores that are just starting to take off, like brand partnerships, analytics, paid ad optimization, hiring, sourcing products from overseas, and product development. Drop shipping is popular topic here, and they also focus a lot on growth tactics. 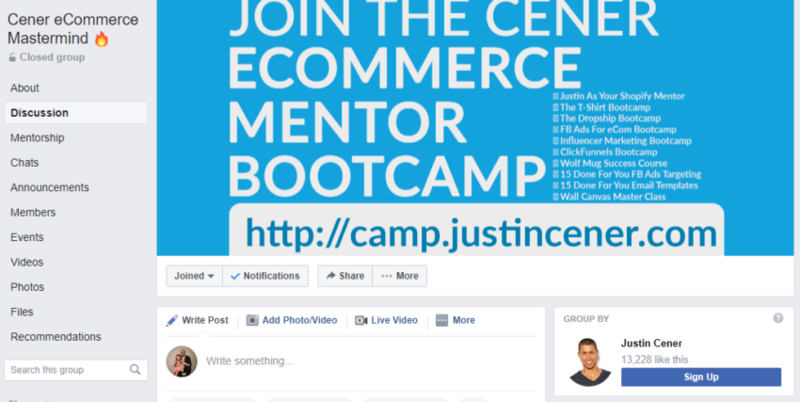 Be forewarned: this is one of the most active eCommerce groups on Facebook. There often upwards of three dozen new posts each day. This is another unofficial Shopify group, so if you use Shopify, you’ll like the focus of this group. Conversations focus on topics like how to use specific apps, how to customize Shopify themes, and using specific features of the platform. They discuss broader eCommerce topics as well, but usually within the context of Shopify. In addition to sharing articles and resources about Shopify and eCommerce, members of this community often ask questions about specific aspects of the platform or seek recommendations on apps and services to use. Sometimes people post their shops for critique from the group, too. The last Facebook eCommerce group on our list is another big one. There’s a lot of content here, so don’t stress yourself about keeping up. This group covers a wide variety of topics, from marketing, to sales, to logistics. It also seems like this group has more members from outside the United States than some of the others on this list, which makes it a good one to join if you sell to customers all over the world. A common topic of conversation is how to support shipping worldwide and marketing to an international audience. The group’s founders, Steve and Evan Tan, are eCommerce veterans who have created several million dollar stores. They’re very active in the community, especially on posts that get a lot of attention. These communities didn’t make our list of the top Facebook groups, but they’re worth a read if you’re looking for additional communities to follow or participate in. Online Samurais – Another Shopify group. CopyMonk – A small group, specifically about eCommerce copywriting. Go Krispy Ecom Strategy – Focuses on Shopify and selling via Facebook. Grow & Sell – General eCommerce discussions lead by Shopify staff and merchants (though still not an official group). 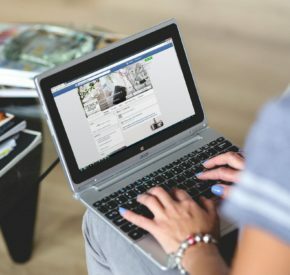 So you’ve decided to invest some time into Facebook eCommerce groups? Great! Getting value out of these groups can be tricky, though. They tend to have a high noise-to-signal ratio and the volume of posts for some groups can be overwhelming. These tips will help you pull the most value out of your experience. Many Facebook group members fail to get the total experience from the group because they passively consume content without participating. There’s some value in simply reading other people’s posts and comments, but you’ll learn more by commenting yourself and engaging with the group. You’ll also build stronger relationships when people begin to see you as a value-adder. Remember the 90-9-1 rule of the internet, a variation of the Pareto Principle. It basically says most value in an online community will be created by just one percent of the users, while 90 percent will be lurkers who either just consume content or else only stop by once in awhile. You’ll get more value if you get actively try to be in that one percent (or at least in the nine percent who participate from time to time). If your goal is to learn, don’t shy away from asking questions, even if you think others will consider the questions basic. Use their responses as a stepping-off point for further research and discussion. While it’s possible to join a Facebook group as a brand page, it’s better to join with your personal account (that has your name and photo). People are less likely to engage with a brand and, more often than not, they’ll assume you’re only there to promote yourself. Using a personal account will make your questions and responses seem more genuine and trustworthy, and that will pay dividends down the road. Every Facebook group has influencers who post and comment more than everyone else. You’ll see these power users regularly. Identify them and engage with them often. They often have the best knowledge, insight, and access to resources, and may open you up to business opportunities. Whenever you make a post, support it with an image, GIF, video, or link. Facebook will prioritize these over text-only posts. People prefer to interact with them more as well. They also make your content more valuable—and enjoyable—for other people. Don’t miss an opportunity to foster a relationship you make in a Facebook group to a medium you control, like private messaging or email. This way you can keep in touch even if if one of you stops participating in the group. It’s tempting to share your own content (you put a lot of time into it, after all! ), but most groups frown on that kind of self-promotion. Focus on sharing other people’s content to build good will with the group and its administrators. If you do share your own stuff, make sure to put some value in the post itself to stimulate discussion, and do so sparingly. One exception to this may when when you’re answering a specific question. Be sure to answer the question fully on Facebook, but if a piece of your own content (e.g., a blog post or YouTube video) goes more in depth, you may be able to link to it without coming off as spammy. Be sure to check each individual group’s rules, though, as they vary in what they’ll allow. See what other members do with their own content before sharing your own. While Facebook communities are superb places for information, remember that you’re still talking with people on the Internet who may be less knowledgeable/experienced than they admit (and, while rare, so may even have malicious intentions). Before you take advice, research their recommendations in other places to confirm, then run your own tests. For instance, if someone says “People like round number prices these days,” don’t change every price on your store until you have some of your own data to base the decision on. It doesn’t matter how much you know, there’s always something out there to learn. The best way to keep up with eCommerce news, trends, tools, and best practices is to engage with the community. If you invest time into some of the top Facebook eCommerce groups we’ve listed here, you’ll grow as a professional and grow your business.